Preview: Skytear - battle in the flying arena! For a moment, the protectors of the legendary forest devoted themselves to rest and did not watch their citizens. It was enough for a quick mankind to rush into the unprotected forest and start claiming it for themself. Their city, hungry axes and restless legs began to interfere with the lives of all the beings that had been hiding among the trees for centuries. All preparations have been begun to awaken the guards, but their sleep is deep and it will take a while to get them out of the slumber. In the meantime, the forest owners must defend themselves. 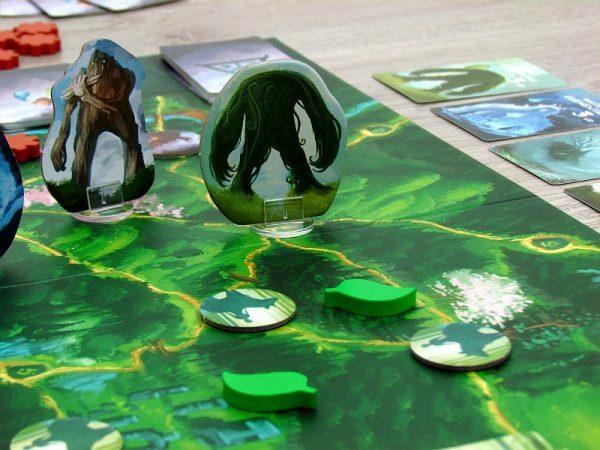 It is in such a forest, on whose edge the city stands, where two players get to live in the board game Haven. This is news addition to stable of our favorite Red Raven Games publisher. This new box was created by Alf Seegert with Ryan Laukat’s unmistakable illustrations. 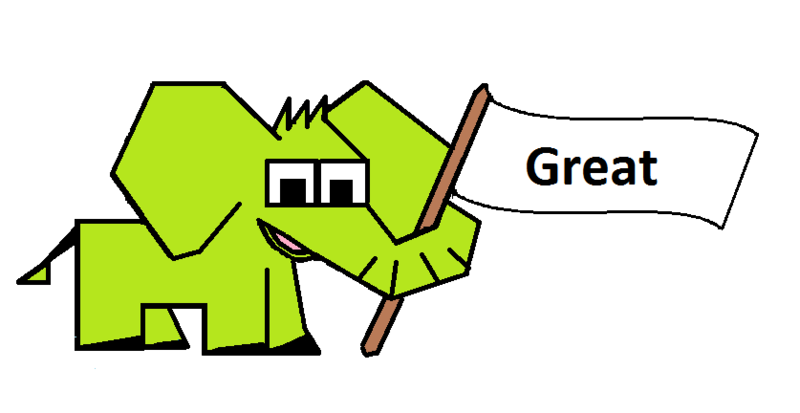 The game came out in 2018 and immediately jumped on the Esdevium Games distribution train to get to all the players as fast as possible. All the fun is hidden inside a green box, with look at the forest on the lid, that plays the main role here. 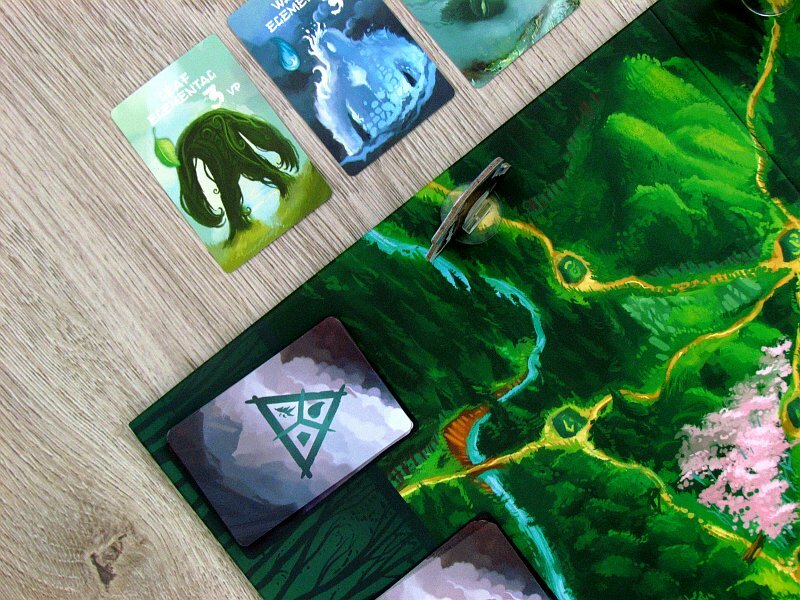 Both opponents set the game board between themselves, and also determine, who takes which of the two available roles – one is going to play for the forest and other for the city. Map is interwoven with a series of paths, and there are shrouded shrines at every cross. Three of them will be initially filled with cardboard elemental figures. Next to the board, players also prepares set three types of lore to create space, where players will putting their cards during the game. 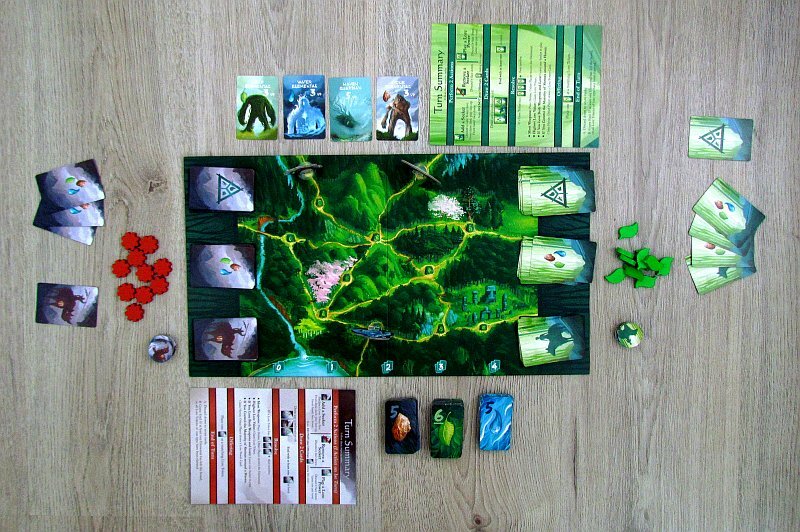 Players then gather components belonging to their nation and place them in three designated places on the board (seekers, victims and lore). In their hand, they get a starting set of cards from these piles, they also get shrine token and ten havens of their color. Both opponents alternate in a game on a turn that consists of five phases. 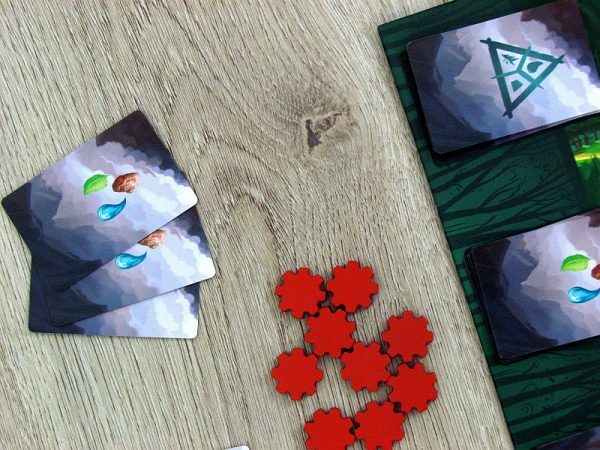 Everything starts with the chance to play up to two seekers in one of three available columns of elements – leaves, water and stone. You can use not only a card from your hand, but also a drawing deck. But while the hand is played secretly with picture down, additions from the common stock are immediately revealed to everyone. 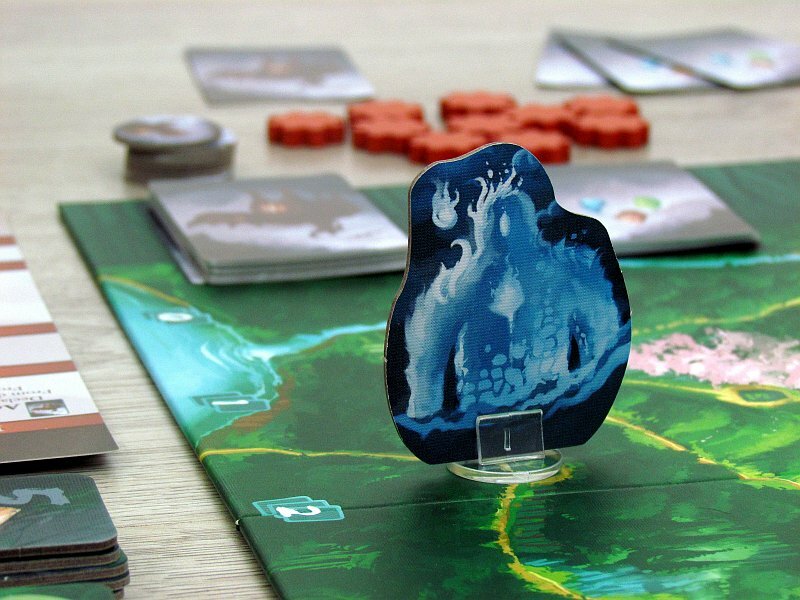 However, the player may remove one of his seekers in the first phase of his turn. Subsequently, a player can draw two cards from his three piles in any combination. There are not only seekers hidden, but also offerings and lores. They will be placed later in the turn and by placing the sacrifice to one of the columns attracts attention of elemental. Number of offerings plays a role in deciding, whether the column is already set to be evaluated. In such a situation, usually there will be a number of cards on the table, but at least three cards of them are offerings. At that moment, the game is immediately taken to the battlefield. Both opponents will reveal the identity of their cards in that column and try to stay within limit of value required by top token in the middle. 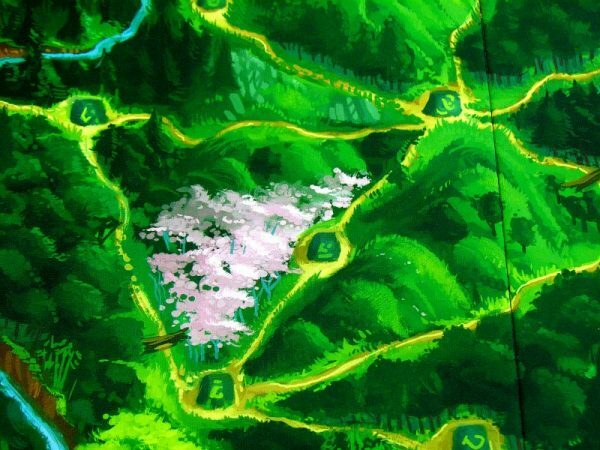 Then follows a direct duel between the city and the forest by comparing the arrow and sword symbols on the seekers. The winner will get a chance to place his shrine at the junction, where the elemental of that type is currently standing. The loser, on the other hand, gets a chance to move a character of water, stone or leaves to any other free junction on the map afterwards. Shrine on the move affects majorities of players on the map and their control over the individual sections of the forest, that are created by paths on the entire map. 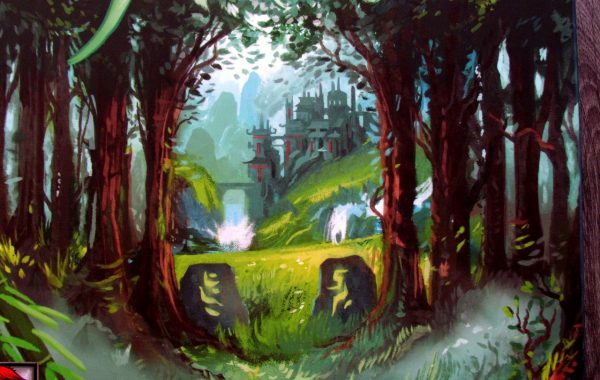 These are the sanctuaries, and if someone, by placing a new shrine token, gets majority surrounding some of the green areas, he can take conrol of it with his token. Evaluating lore itself is not just about strength. Who can win a higher sum within the limits allowed by the elemental will also capture the token itself. This will reveal a new token in the stack creating a new limit for that column. At the end of the turn, player must not hold more than seven cards in his hand. Game ends, when the players divide among themselves all the learning tokens of one type. 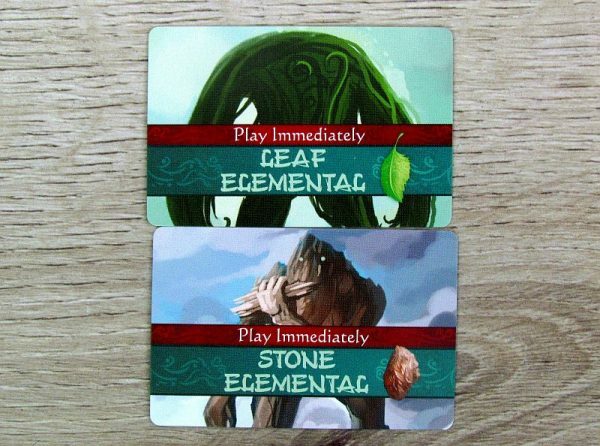 Players will receive victory points for element, in which they have acquired the highest amount of lore tokens. The player, who managed to pull the most sanctuaries to his side now draws forest guard towards himself. 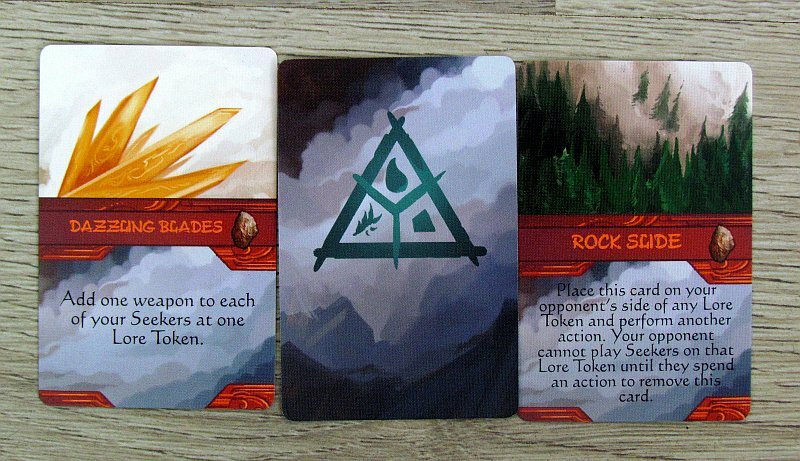 To points already acquired, both opponents add the numbers of lore tokens and shrines placed. Whoever has higher overall amount of points becomes the winner of the duel. 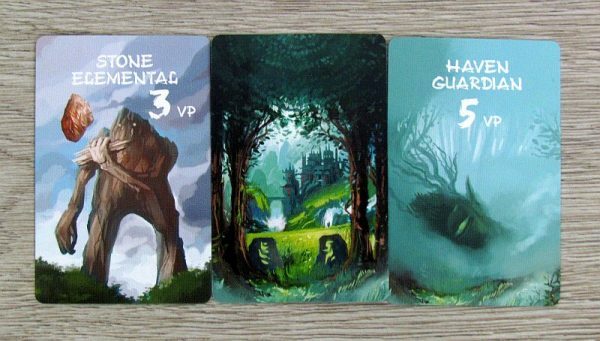 Haven offers a mystical duel, in which players will have to balance their strengths really well. 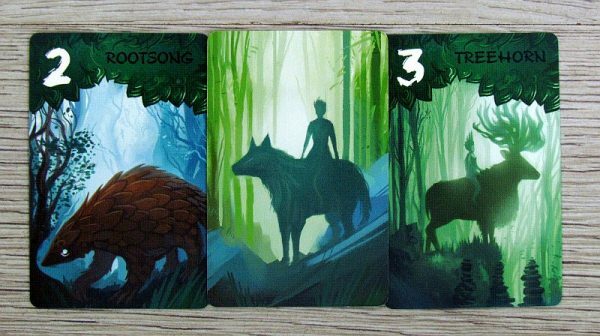 Inside, it’s an inconspicuous game of majority, but everything is cleverly concealed under the cards and maps, so it looks like it has more to offer. 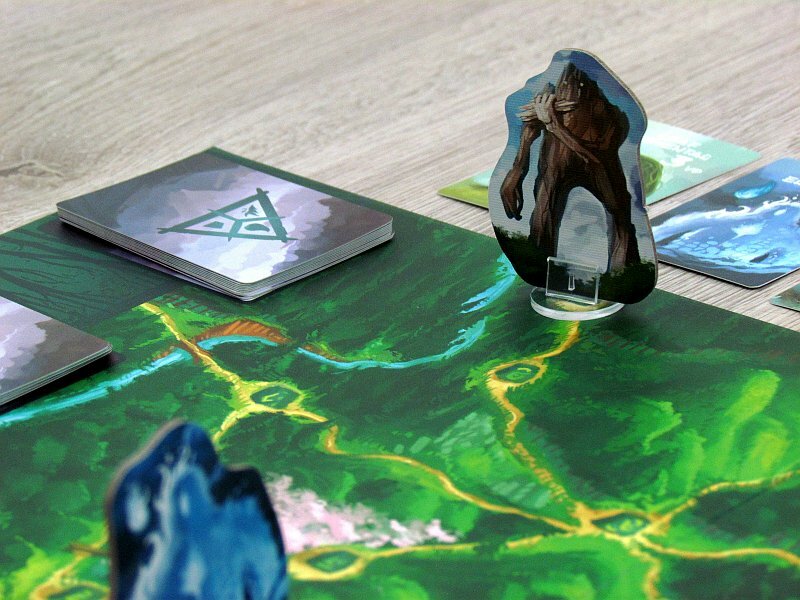 Players build their territories and have to deal with range of cards, they have in their hand. 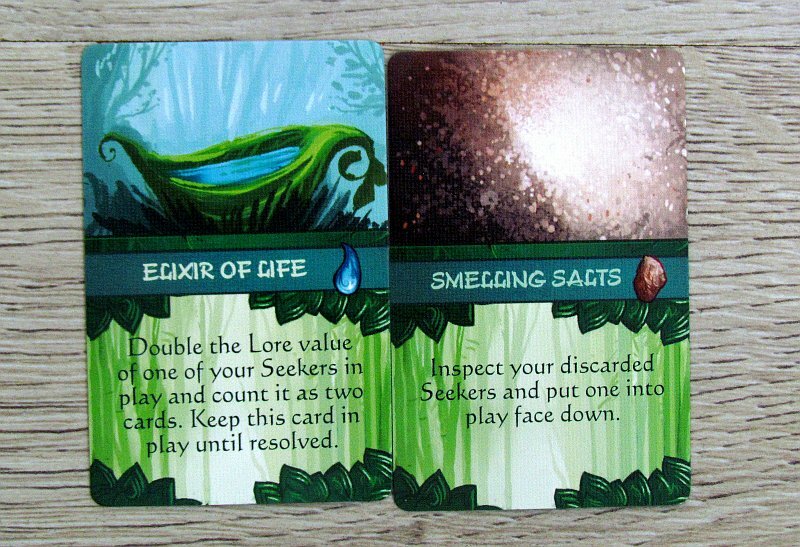 Card drawn must match the player’s situation, since he has three piles with different content to choose from. Every kind has its use, and it is up to the players to keep the ratio of cards in hand based on his tactics. He determines, which piles he draws from, but the coincidence has something to say to it as well. The content of the package is shuffled before the game starts. 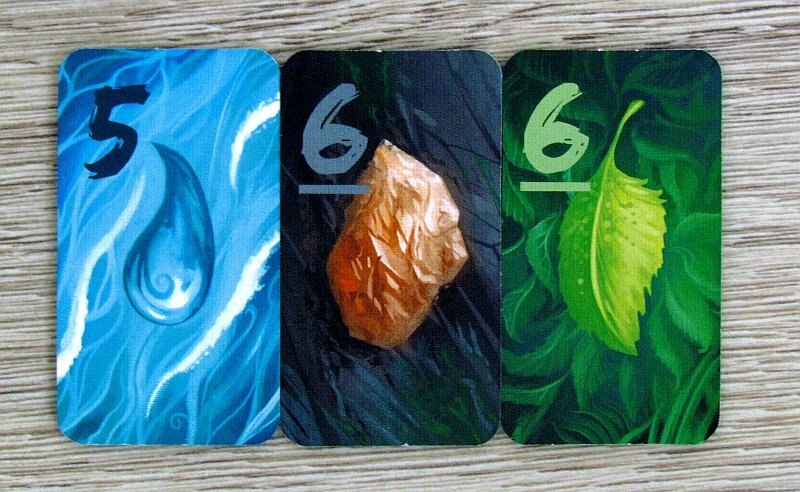 But the cards are inlaid secret, so players can bluff in addition to adding real numbers. At first glance it looks like a duel of two opponents with a prey in the middle, as in the classic game Schotten Totten. But victory on this front only means a chance to influence the situation on the map and finally to gain control over a piece of forest. 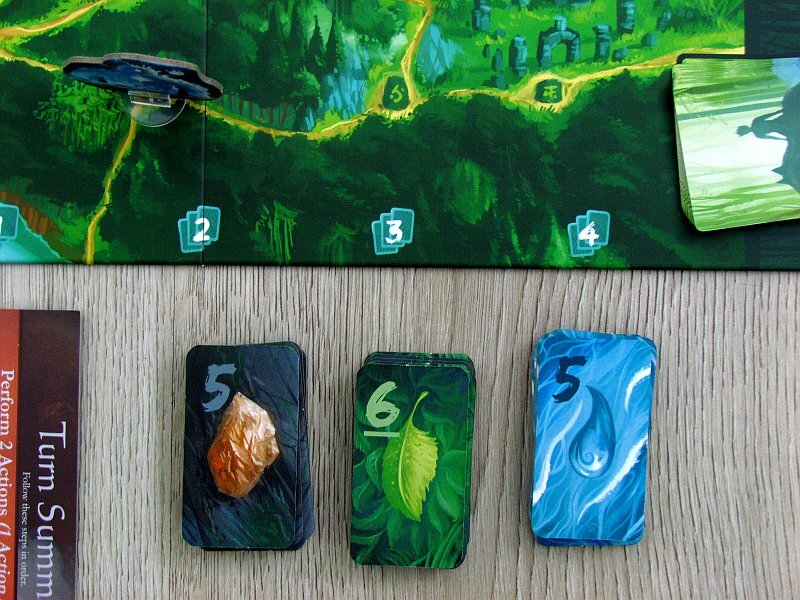 The theme is surprisingly well-suited and very well described across the different elements of the rules. Calling for elementals attention is fun. Players have to plan ahead of time, which tokens they will be bidding for next time. This biphasis results is a really interesting part of the game, in which both opponents must constantly think of their next action in advance. Even though the turn phases themselves are fixed, the players make the choices themselves. Duel is exactly how this game should be played. Both opponents are constantly dragging for the map and fill it with tokens. However, game does not last long too enough. All territories will be divided in half an hour, which is the exact match of the game. The gameplay is not entirely intuitive. Even the rules do not allow you to learn it easily after one reading, but you need to set it up, try it out and after just a few rounds, everything is clear as it should be. The game itself is really simple and its great plus is also a really low price tag. It will be therefore even more surprising to see how the game looks as it becomes dominated by wonderful fairy-tale illustrations. But this is not the typical fairy tale, but it is moving lightly towards the Japanese style. 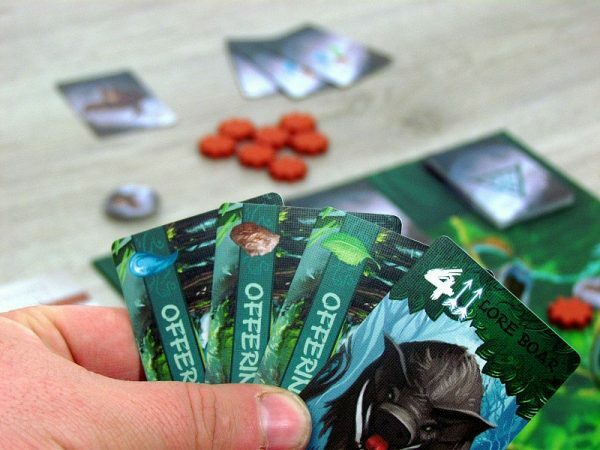 The price is not increased with unnecessary minitures, but instead there are quality cardboard components and nice wooden tokens. Haven is a game that combines a lot of little things and together creates a really good image of board game for two opponents. Entertainment is on the brink of tactics, planning, and coincidence, just to please everyone. The choices in the game are not easy and the way to high point gain is not certain. 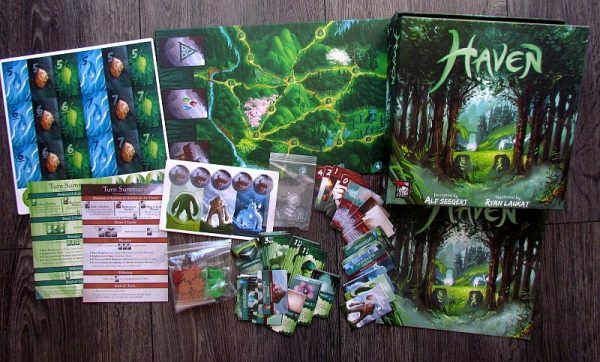 But what is certain is the fact, that Haven is a very fun and solid little game. Haven is a game, that attracts a number of people with its graphics. Fortunately, even gameplay does not make them go away, because it combines fight for territorial dominance with the secret assignment of cards in the auction and fight. There is no extra detail in the game, so there is no learning curve - it only takes a moment before you all know how to play. The rulebook is not arranged well. 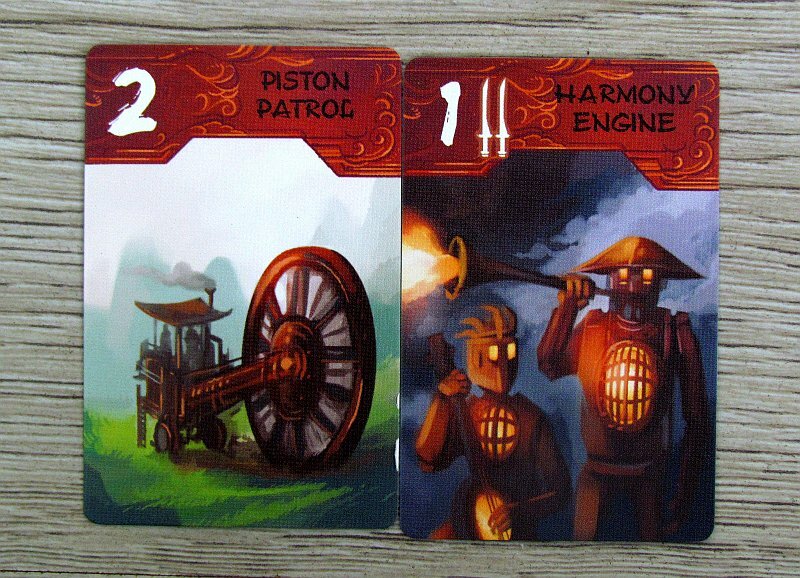 Haven is a duel game and as such it deserves a great compliment, which is only crowned with beautiful illustrations.